Multi & Remote Unit Refrigerators! Even in times of abundance, where a less than optimum, management might have been easier forgiven, savings on resources, was a value that made some companies stand out and flourish. Nowadays, saving has become a “core” value, literally and metaphorically, for any professional who wants to have a sustainable business. The market conditions currently, leave less room for mistakes and every detail counts and contributes, to the end result. 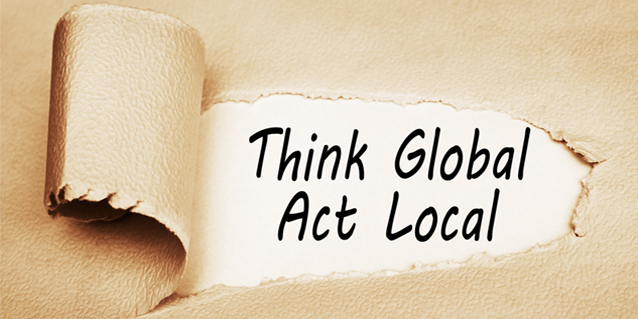 A business can save resources in many ways and on multiple levels. Moreover, while investing time into this, new ways will surely surface! The financial operation of a catering related business and how refrigerators contribute into it, is an issue that our Blog will be dealing with extensively from now on, since we have been focusing on Energy Consumption and other resources saving for a long time and we intend to continue on this path! We believe that, the refrigerator, apart from covering the basic human needs of both survival and health, may also contribute to the efficient operation of a company, if it is approached as a management tool, rather than just a plain storage appliance. 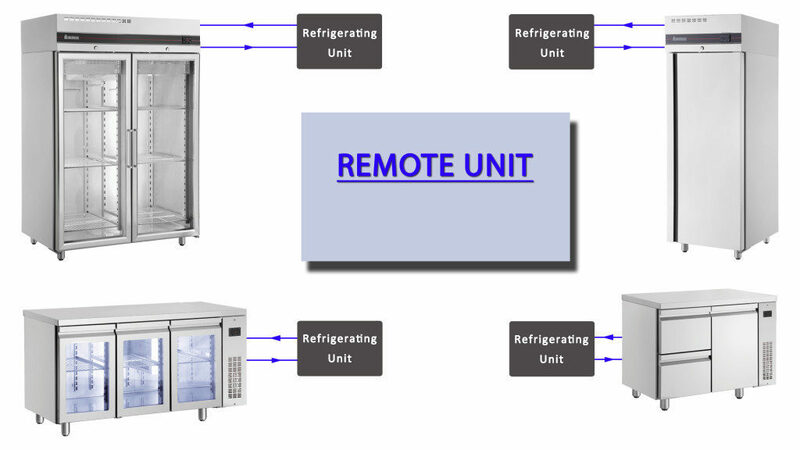 This article focuses on refrigerators with centralized or remote refrigerating units or Multi & Remote Unit Refrigerators ,as we call them, respectively. But what do these “exotic” terms mean? 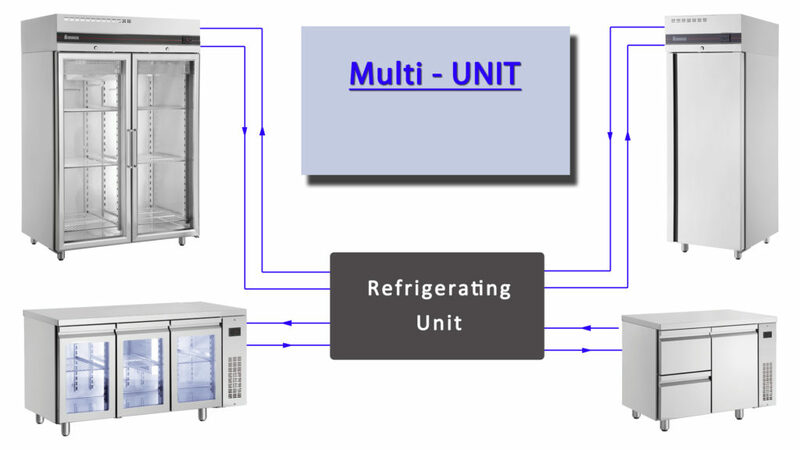 Multi & Remote Unit Refrigerators: Centralized operation for multi-ple profit! In simple terms, the aforementioned “exotic” terms refer to refrigerators, Uprights or counters, without a built-in cooling unit. Instead they are prepared to be connected to a centralized refrigeration unit, powerful enough, to ensure the correct operation of all connected appliances. Let’s see in more detail, the operation of these two arrangements and the advantages of choosing them, as compared to a traditional refrigerator with a built-in refrigerating unit. The most typical example of such an arrangement is the classic Air-conditioning Units present in almost every house! There is a terminal unit inside the area and the corresponding cooling unit is mounted outside of the building. In this arrangement, each refrigerator is powered by a dedicated refrigeration unit. The heat emission on the environment is considerably reduced and thus neighboring devices function more effortlessly & economically. The atmosphere is kept cleaner due to the reduction in the number of cooling units. These cooling units stir the air & the dust, continuously with their fans. Low temperatures and cleaner atmosphere make the employees more efficient. The noise is considerably reduced, which has also a positive effect on the employee performance. Refrigerated counters feature a shorter length, compared to the built-in unit version, increasing thus, the refrigerated space in the kitchen. Maintenance and cleaning of the refrigerating units are easier, because of their placement outside of the building. The refrigerators allow for more fine-tuning which ensures a smoother operation. This allows for a more efficient functioning of the appliance. In the second case, as illustrated in the figure below, two or more devices are connected to a central refrigerating unit. The centralized management, as an idea and a way of operation, is a common issue wherever resources’ saving is discussed. A typical example for this case, which most of us have in our house, is the radiator, where a central boiler drives numerous radiators or several flats with numerous radiators. Likewise, a central refrigerating unit is used to power refrigerators that have the same function e.g. a network of chillers or a network of freezers. In addition to the advantages of the Remote Unit installation described in the previous section, in the case of the Multi arrangement, there are also less maintenance costs and time, since there is a single cooling unit. Before proceeding, something very important needs to be mentioned. All the available solutions that exist in the market,do so for one reason: They meet specific unique needs. The same applies to the refrigerators with a built-in unit. These have their own advantages and can also be economic in their operation if they certified for their Energy Class according to current legislation, as all our refrigerators. Besides, taking into consideration some small but important details, which will be analyzed shortly in a next article of our Blog on the operating conditions of a conventional refrigerator, their advantages are also important. So if you want to have the most refrigerated capacity, with a low temperature dust-free working environment. this is the product you should go for, as simple as that! Summarizing everything mentioned above, the values that govern this family of products are functionality, customization and economy. Besides the obvious advantages related to the remotely placed refrigerating unit, the most important value for us, lays in the most important resource of every business: the people. By creating a friendlier working environment for the kitchen staff, a better mood and the resulting increase in performance, will be visible to all inside & outside of your business. And we can guarantee that your customers will notice it for sure! If the intended use and your premises allow for it, the option of installing a network of refrigerators with a remote unit, will contribute to a beneficial environment for your Catering Business on multiple levels, making to stand out from the competition! PreviousPrevious post:Loading the Appliance for Maximum Performance!NextNext post:Refrigerators with Glass Doors: An unnecessary expense or an investment making a difference?